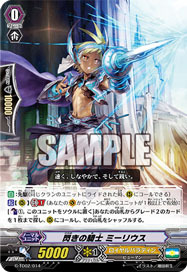 [A] [(V)/(R)]: When this attacks a Vanguard, if you have an ::Angel Feather:: Vanguard, this gains +2000 Power for the battle. This is the sancturay that shall not be broken through. No tresspassing unless you are a patient!